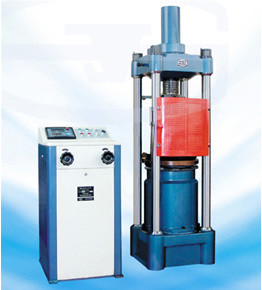 ES-2000C hydraulic direct compression testing machine is mainly used to various materials compression test. Such as cement, concrete, brick of diverse materials, rubber tray, concrete component, metal component anti-compress strength. This machine is consisted of load frame, oil source, control cabinet, digital meter. It adopts hydraulic load, oil pressure transducer to measure load, digital display, with peak value holding and loading speed display function. The load frame is four columns tower structure, crosshead is supported by four columns on the base, and is tighten by screw cap. Upper platen is mounted at downside of the screw rod that on the crosshead, one active chain wheel installed on deceleration motor, the active chain wheel drive the driven wheel through chain, then rotate screw nut, and driving upper platen on screw rod up and down. Working table is on the oil cylinder and piston, sphere base and lower platen is on the working table. The round reticle of the lower platen is convenient to the operator to place specimen. Oil pipe and oil source in the load frame is connected. This load frame with an appearance patent.